Refrain from reading further if you want to watch the movie in the near future. The Big Sick is a light-hearted romantic\ comedy movie - like the ones you watch on Romedy Now TV channel. After watching the movie you feel a kind of subtleness reflected in you from the storyline & the characters of the movie. Sometimes love is just about showing up, being there, being available, though the other person may not realize it. Everyone is super busy or they appear to be these days & sparing the few precious moments of your life for another person means that you are giving away something valuable part of yourself i.e your time. Working on a relationship to care & share the little joys of life, means a lot in building a relationship. This movie tells that relationship are not built in a day, or there is a great attraction at work to make it happen instantly but takes courage & persistence to just make things right coz that makes sense. 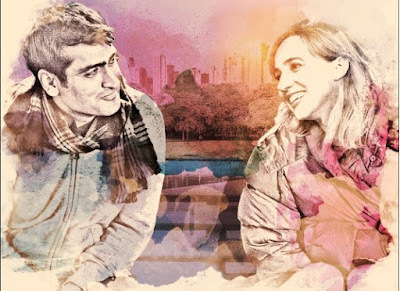 Kumail, the actor plays his own character in the movie, does a superb job whereas acting doesn't come naturally to Emily. Kumail- A Pakistani, who drives a cab in the US tries to impress Emily parents, when Emily gets hospitalized for some serious problem, the subtle light-hearted humour in this context & situations is refreshing here. Kumail also tries his hand in stand up comedy which is catching up a lot these days. He is really not funny on stage & creates a pathetic situation pouring his heart out in front of the audience. That's the way the story starts when he meets Emily - one of his audience & ends too in a similar setup. Sometimes love is the hope to hold onto someone or something, knowing that perhaps its not meant to be, perhaps its meant to fade away or die or fail, but still trying, waiting it out. The story revolves around the stereotypes and cultural differences between Pakistani & US mindsets. In nutshell, a good watch if you like a slow-paced, light-hearted comedy.